Summer 2006. I have the opportunity to take a trip to Zanzibar archipelago, off the coast of Tanzania. This one-month stay is the occasion to make some conchological observations and collects in the Indian Ocean, and I prepare myself by reviewing my short bibliography on the region. 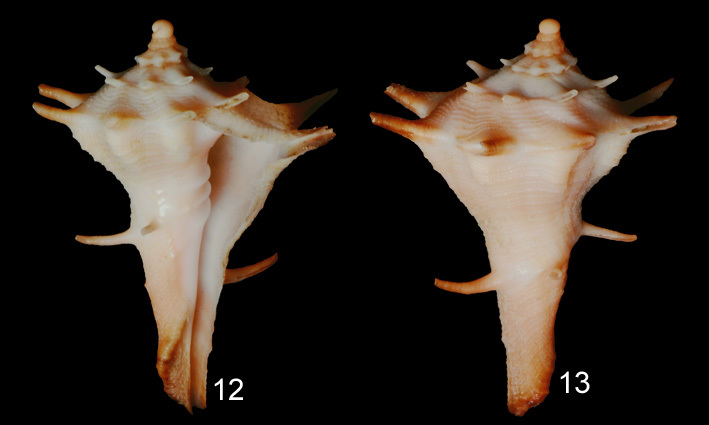 In the Compendium of Abbott and Dance, I focus on the members of the Turbinellidae family by discovering two particularly interesting shells: the yellow form of Vasum rhinoceros (Gmelin, 1791) and Tudicula zanzibarica Abbott, 1958 (Fig 1 and 2), another Vasinae endemic to the area. These two species are particularly beautiful and rare, which places them at the top of my seashell wishlist. So I continue my research with the first volume of the book The sea shells of Dar es Salaam by Spry without finding particular information. In the Lindner guide, I observe a confirmation for the yellow form of V. rhinoceros, which shows a white columellar callosity, contrary to the brown color observed on the typical form. The author specifies that there is "only one colony near Zanzibar". The remark is vague, but still indicates a certain geographical limitation regarding the occurrence of this variation. In the 22nd edition of Rice's Prices, a typical V. rhinoceros from East Africa costs $6, while the albino form reach $115. Are these specimens really affected by albinism, or does this price simply relate to the "yellow form" that I'm looking for? The same list announces the Vasum zanzibarica of Tanzania at $60, which indicates a larger locality than the archipelago of Zanzibar. I order the copy of Notulae Naturae where Abbott describes the species Tudicula zanzibarica. The article indicates that it was discovered during a research expedition initiated by the Academy of Natural Sciences of Philadelphia and carried out between January and March 1957. The technique of harvesting was dredging between 10 and 45 meters deep, and only one locality out of 45 allowed to catch live specimens. This site is located about 800 meters southwest of Ras Nungwi, the northern tip of the main island Unguja. The author indicates that T. zanzibarica was dredged on 15-meter bottoms composed of sand, shell debris and fine grasses, probably of the genus Zostera. In the Compendium, the depth is marked at 6 meters, which leaves a suitable margin for snorkelling explorations. This is all for the biology of the species, but it is possible to think that the animal is carnivorous like other members of the family, and its capture could be done using traps with mollusks or worms as bait. Reading an article by Rosenberg and Richard, I also learn that the taxon Tudicula zanzibarica has entered synonymy since 1987, and that the proper name is now Tudivasum zanzibaricum (Abbott, 1958). In summary, I should look for V. rhinoceros "yellow form" a little randomly in areas suitable for the development of colonies of the typical form, and T. zanzibaricum near seagrass beds on sandy bottom with debris, especially in the north of the island. I fly to Zanzibar with very little clue to find these rare shells, so my motivation is strengthened. As soon as I arrive in Stone Town (the old part of the capital Zanzibar city), a small exploration of the souvenir stalls allows me to have a panorama of the most sold species. Photographs of my Turbinellidae in hand, I ask traders if they have ever seen these species. A few V. rhinoceros eroded later, I realize that the purchase of shells in town only allows to acquire common species, often of poor quality. Between the baskets full of Cypraea tigris, Palmadusta diluculum or Erosaria lamarckii, the aging stocks of Strombus gibberulus and the dusty accumulations of Cassis cornuta and other Lambis lambis, Stone Town stalls are a hymn to overfishing without proper control; and no one has heard of T. zanzibaricum. Destination Nungwi, the type locality indicated by Abbott. For a week, the dives do not give anything conclusive, except the discovery of a very damaged coral zone where the empty shells of juvenile V. rhinoceros accumulates (Fig 3). It is later, during a dive in Kizimkazi, the southern tip of the island, that I observe a live colony whose individuals bury themselves during the day in the sand under the coral boulders (Fig 4 , 5, 6). After a quick and unproductive journey due to illness on the island of Pemba, I find my marks near Nungwi, widening the research zone further south in the west coast and diving deeper, near meadows that grow between 10 and 30 meters deep. It is following the traces left in the sand by some Terebras that I discover my first concrete clue, the spiral piece of a Vasinae. The suture resembles that of a Vasum, but the fineness of the shell leaves me thinking of a piece of Tudivasum, without being able to confirm it. On the way back, a few meters from the shore, I reflexively lift a V. rhinoceros which shows a clearer mouth than its congeners, and gives me the conviction to find what I am looking for soon (fig 7). I then multiply my observations in this zone and I set up a net trap near the meadows, at about 25 meters deep. This isn't a success, because the bait is quickly devoured by fish or by the Nassarius that swarm in this place. Moreover, all my attempts at local fishermen have failed. A change of residence is often very useful, and it is off Kendwa that I continue my investigations. The coral reefs are more preserved than in Nungwi, the denser meadows and sandy bottoms richer in food. For a week, I improve my traps by using fagots buried in the sand and protected by stones. Worms do not appear to be of interest to molluscs, but several species of bivalves yield results for some Naticidae, Olividae and Nassariidae. I observe that the flesh of Gafrarium pectinatum attracts the majority of burrowed species, and that of Chlamys senatoria pleases the Olives. I have ten days left to spend on the island and I have set up a dozen traps checked every day with more and more results, especially in the areas where coral debris accumulates, in the sandy basins at the heart of the Zostera beds. One morning I have the pleasure to find three V. rhinoceros next to a trap, and two of them have a very clear external color, almost beige, and a columellar callosity much less brown than that of their congeners. A thorough research in the southwest of this area, on a shallow sand bank located far from the edge, will finally allow me to discover a colony of Vasum with the shell almost yellow, but whose individuals still have dark spots on the columella (Fig 8 and 9). No matter what, the tests are beautiful, very little eroded, of nice size and two of them will join my collection. Despite my repeated efforts and hours of reviewing every member of the colony, no trace of the famous white callosity, but a juvenile specimen found dead with an octopus hole might have developed it (Fig 10 and 11). Four days before returning to France, all hope seems lost about T. zanzibaricum, and I then try to sift the coral sands to find micro-species. I notice that the bottom of the sandy bowls, which have large debris, are particularly rich. In of one of them, at a depth of 8 meters, I nearly drink the cup of surprise: Tudivasum zanzibaricum lay there, freshly dead, covered with green algae and half-sanded. The shell is not that of an adult but it is almost intact, the finest parts remain and the apex is perfect. After drying, the miracle shell is packed with all possible precautions for the return journey. It is at home that a meticulous cleaning will bring out its magnificent colors, worthy of a specimen harvested alive (fig 12 to 16). This hunting of the rare Vasinae of Zanzibar thus ends in a half-tint, and I would of course have preferred to find V. rhinoceros with a beautiful white callosity and T. zanzibaricum adult and alive. But the story that accompanies each of the harvested shells may be worth more than the money I would have spend to acquire "perfect" specimens on the market. Été 2006. J’ai l’opportunité d’effectuer un voyage touristique dans l’archipel de Zanzibar, au large des côtes de Tanzanie. Ce séjour d’un mois est l’occasion de faire quelques observations et collectes conchyliologiques dans l’océan Indien, et je m’y prépare en passant en revue ma courte bibliographie sur la région. Dans le Compendium d’Abbott et Dance, je m’attarde sur les membres de la famille des Turbinellidae en découvrant deux coquilles particulièrement intéressantes : la forme jaune de Vasum rhinoceros (Gmelin, 1791) et surtout Tudicula zanzibarica Abbott, 1958 (fig. 1 et 2), un autre Vasinae, endémique de la zone qui m’intéresse. Ces deux espèces sont particulièrement belles et rares, ce qui les place en tête de ma liste de souhaits coquilliers. En résumé, je devrais chercher V. rhinoceros "forme jaune" un peu au hasard dans des zones propices au développement de colonies de la forme typique, et T. zanzibaricum près des herbiers sur fonds sableux avec débris, en particulier dans le Nord de l’île. Je m’envole donc vers Zanzibar avec très peu d’indices pour trouver ces coquilles rares, et ma motivation n’en est que renforcée. Dès l’arrivée à Stone Town (la vieille ville de la capitale Zanzibar city), une petite exploration des échoppes à souvenirs me permet d’avoir un panorama des espèces les plus vendues. Photographies de mes Turbinellidae à l’appui, je demande aux commerçants s’ils ont déjà vu ces espèces. Quelques V. rhinoceros érodés plus tard, je me rends compte que l’achat de coquilles en ville ne permet d’acquérir que des espèces communes, souvent de piètre qualité. Entre les paniers pleins de Cypraea tigris, Palmadusta diluculum ou Erosaria lamarckii, les stocks vieillissants de Strombus gibberulus et les accumulations poussiéreuses de Cassis cornuta et autres Lambis lambis, les étales de Stone town sont un hymne à la surpêche sans véritable contrôle ; et personne n’a entendu parler de T. zanzibaricum. Destination Nungwi, la localité type indiquée par Abbott. Pendant une semaine, les plongées ne donnent rien de concluant, sauf la découverte d’une zone corallienne très abîmée où les coquilles vides de V. rhinoceros juvéniles s’accumulent (fig. 3). C’est plus tard, lors d’une plongée à Kizimkazi, la pointe Sud de l’île, que j’observe une véritable colonie, dont les individus s’enfouissent la journée dans le sable, sous les blocs coralliens (fig. 4, 5, 6). Après un passage rapide et peu productif pour cause de maladie sur l’île de Pemba, je retrouve mes marques près de Nungwi, en élargissant la zone de recherche plus au sud de la côte ouest et en plongeant plus profond, près d’herbiers qui se développent entre 10 et 30 mètres de profondeur. C’est en suivant les traces laissées dans le sable par quelques Térèbres que je découvre mon premier indice concret, le morceau de spire d’un Vasinae. La suture ressemble à celle d’un Vasum, mais la finesse de la coquille me laisse penser à un bout de Tudivasum, sans pouvoir véritablement le confirmer. Sur le chemin retour, à quelques mètres du bord, je soulève par réflexe un V. rhinoceros qui montre une ouverture plus claire que ses congénères, et me donne la conviction de trouver bientôt ce que je cherche (fig. 7). Je multiplie alors mes observations dans cette zone et j’installe une nasse en filet près des herbiers, à environ 25 mètres de profondeur. Sans succès, car les appâts sont vite dévorés par des poissons ou par les Nassarius qui pullulent à cet endroit. De plus, toutes mes tentatives auprès des pêcheurs locaux ont échoué. Un changement de résidence va s’avérer très utile, et c’est au large de Kendwa que je poursuis mes investigations. Les fonds coralliens sont plus préservés qu’à Nungwi, les herbiers plus denses et les fonds sableux plus riches en nourriture. Pendant une semaine, j’améliore mes pièges en utilisant des fagots enfouis dans le sable et protégés par des pierres. 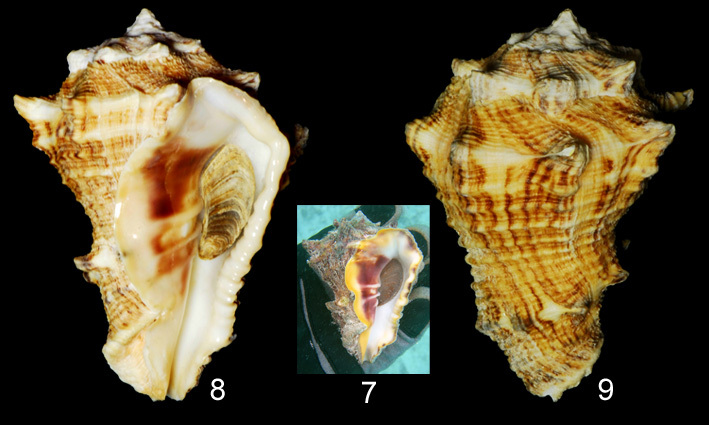 Les vers ne semblent pas intéresser les mollusques, mais plusieurs espèces de bivalves donnent des résultats pour certains Naticidae, Olividae et Nassariidae. En tâtonnant, j’observe que la chair de Gafrarium pectinatum attire la majorité des espèces fouisseuses, et celle de Chlamys senatoria plaît beaucoup aux Olives. Il me reste dix jours à passer sur l’île et j’ai installé une dizaine de pièges que je relève tous les jours avec de plus en plus de résultats, surtout dans les zones où s’accumulent les débris coralliens, dans les cuvettes sableuses au cœur des herbiers de Zostera. Un matin, j’ai le plaisir de trouver trois V. rhinoceros à côté d’un piège, et deux d’entre eux ont une coloration externe très claire, presque beige, et une callosité columellaire bien moins brune que celle de leurs congénères. Une recherche approfondie au sud-ouest de cette zone, sur un banc de sable peu profond situé loin du bord, me permettra enfin de découvrir une colonie de Vasum à la coquille presque jaune, mais dont les individus présentent encore des taches foncées sur la columelle (fig. 8 et 9). Peu importe, les tests sont magnifiques, très peu érodés, de belle taille et deux d’entre eux iront rejoindre ma collection. Malgré mes efforts répétés et des heures à passer en revue chaque membre de la colonie, aucune trace de la fameuse callosité blanche, mais un spécimen juvénile trouvé mort à la sortie d’un trou de poulpe l’aurait peut-être développée (fig. 10 et 11). Quatre jours avant de retrouver la France, tout espoir semble perdu concernant T. zanzibaricum, et je m’applique alors à tamiser les sables coralliens pour dénicher des micro-espèces. Je remarque que le bas des tombants qui présentent de gros débris sont particulièrement riches. C’est au pied de l’un d’eux, à 8 mètres de profondeur, que j’ai failli boire la tasse de surprise : Tudivasum zanzibaricum reposait là, mort, recouvert d’algues vertes et à demi ensablé. La coquille n’est pas celle d’un adulte mais elle est presque intacte, les parties les plus fines subsistent, l’apex est parfait. Après séchage, le test miraculé est emballé avec toutes les précautions possibles pour le voyage retour. C’est à la maison qu’un nettoyage méticuleux fera ressortir ses magnifiques couleurs, dignes d’un spécimen récolté vivant (fig. 12 à 16). Cette chasse aux Vasinae rares de Zanzibar se termine donc en demi-teinte, et j’aurais bien sûr préféré trouver V. rhinoceros avec une belle callosité blanche et T. zanzibaricum adulte et vivant. Mais l’histoire qui accompagne chacune des coquilles récoltées vaut peut être plus que l’argent qu’il aurait fallu débourser pour acquérir des spécimens "parfaits" sur le marché.